Automated Fiber Placement is an advanced technology that uses a robotic arm to place fiber reinforcements merged into tows on a mould surface. AFP is a manufacturing process that combines tape placement and filament winding to overcome the limitations and couple the benefits of each manufacturing method. 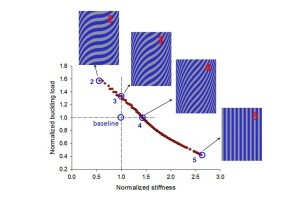 Two key advantages of AFP are: 1) the potential to build -by layer- variable stiffness composite structures with a wide range of complex planar and shaped geometries; 2) the steering of the fibre-tows in the plane of the lamina to create controlled curvilinear paths, thereby opening up the opportunities to define optmized fiber paths for steering. In collaboration with Canadian aerospace industries and the National Research Council (Aerospace Montreal), we work on multiple levels involving the integration of modelling and manufacturing. First we have been tackling the characterization of the geometric defects, mainly gaps and overlaps, which emerge during the manufacturing of curved-shape surfaces and in the presence of holes. 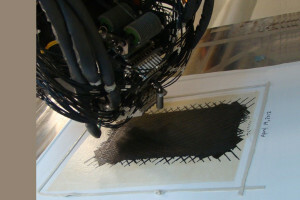 We are using a combination of computational and experimental technique to assess the impact of process-induced defects on the mechanical properties. In parallel, we are looking into ways of best minimizing the presence of detrimental defects so as to create AFP fiber paths that are free of defects or within tolerable limits. In particular, our aim is to exploit design optimization to take full advantage of the structural advantages that a composite structure with optimized curvilinear fiber paths can offer. Compared to traditional composite design for constant stiffness, spatial variations of fiber orientation allows to optimize structural properties that are generally conflicting, i.e. the improvement of one, such as in-plane stiffness, would penalize the other one, such as buckling resistance. To this end, we resort to surrogate modelling and multiobjective optimization to find optimal trade-off designs among antagonist objective functions. 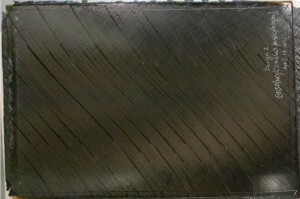 Variable stiffness laminates can be manufactured with Automated Fiber Placement. We then look at the simultaneous optimization of manufacturing and structural design. Fayazbakhsh, K., Arian Nik, M., Pasini, D., Lessard, L., Optimization of variable stiffness composites with embedded defects induced by Automated Fiber Placement, Composites Structures, Vol. 107, pp. 160–166, 2014. Arian Nik, M., Fayazbakhsh, K., Pasini, D., Lessard, L., A comparative study of metamodeling methods for the design optimization of variable stiffness composites, Composites Structures, vol. 107, pp. 494-501, 2014. 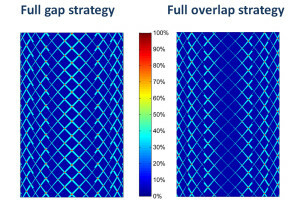 Fayazbakhsh, K., Arian Nik, M., Pasini, D., Lessard, L., Defect layer method to capture effect of gaps and overlaps in variable stiffness laminates made by Automated Fiber Placement, Composites Structures, Vol. 97, pp. 245-251, 2013. 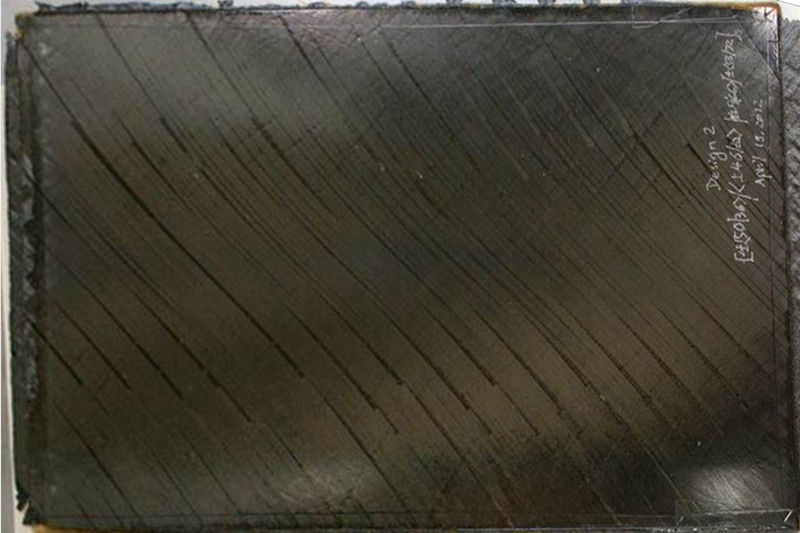 Arian Nik, M., Fayazbakhsh, K., Pasini, D., Lessard, L., Surrogate-based multi-objective optimization of a composite laminate with curvilinear fibers, Composites Structures, Vol 94, pp. 2306–2313, 2012. Croft K, Lessard L., Pasini D., Hojjati M., Chen J., Yousefpour A. Experimental study of the effect of automated fiber placement induced defects on performance of composite laminates, Journal of Composite Part A, vol 42, pp 484–491, 2011.